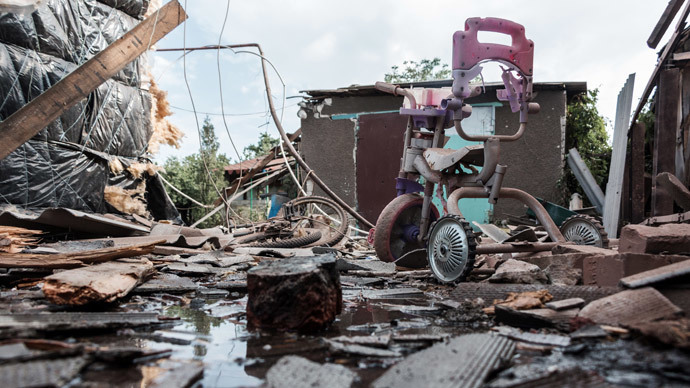 The Organization for Security and Co-operation in Europe has confirmed that shrapnel persistent with 122mm artillery banned under the Minsk packages was used in the latest shelling of a residential area in Gorlovka, eastern Ukraine. “Our monitors were able to go there yesterday to report on the shelling that happened on Tuesday. The shells started to strike at about 18:00 in several locations in Gorlovka,” Michael Bociurkiw, spokesperson for the OSCE Special Monitoring Mission to Ukraine told RT on Thursday. “The shrapnel was consistent with what’s called 122mm artillery. So this is clearly weaponry banned under the Minsk packages,” he added. On Tuesday, a shell hit a residential area in the town of Gorlovka, Donetsk region, in eastern Ukraine. Three civilians, including an 11-year-old girl, her father and another civilian, were killed in the incident. The town has seen heavy shelling since the start of Kiev’s military operation in the region. Senior rebel forces commander Eduard Basurin has blamed the latest shelling on the Ukrainian army. “Our monitors were able to go to the mortuary to confirm that there were three people who died in the shelling,” Bociurkiw said. He said in this ceasefire which “we have labeled as quite fragile,” it is civilians who have been hardest hit. Besides the ceasefire, the Minsk agreement brokered in the Belorussian capital on February 12 and agreed upon by both Kiev and the local eastern militia, included the withdrawal of heavy weaponry from the frontline and establishment of a security zone separating them. According to the document, the zone separating the warring parties must be at least 50 kilometers wide for artillery over 100-millimeter caliber, 70 kilometers for regular multiple rocket launchers and 100 kilometers for heavier long-range weapons. “The OSCE monitoring mission is very busy right now in terms of monitoring what’s supposed to be the withdrawal of heavy weaponry , that has not been a completed exercise by any means. Heavy weaponry continues to be moved around by both sides in the conflict zone. And in addition there are also serious challenges in verifying that the removed weaponry is actually staying put out of harm’s way,” Bociurkiw said. In Shirokyno, which is near the front line, in Gorlovka, in and around Donetsk there have been “explosions numbering in the hundreds” and several in civilian areas, he added. “These are very randomly fired shells,” he said. “The two sides are very close together and when one side fires it often invites return fire,” he concluded. In the latest report dated Wednesday, the OSCE special monitoring mission in Ukraine (SMM) indicated that the number of ceasefire violations had decreased in areas around Donetsk airport. Regarding the shelling in Gorlovka it said that the monitors saw nine crater impacts within a radius of 200 meters at three locations in residential areas. “According to both Ukrainian Armed Forces and Russian Federation Armed Forces officers at the observation point, an unidentified 'third party' was provoking the two sides,” the mission’s report said. The OSCE report did not mention where the fire was coming from, nor did it name the possible perpetrators of the alleged provocations.